The 2016 data from Stats Canada shows the South Winnipeg-St. Norbert ward has tens of thousands more residents than many other wards in Winnipeg . . . with a population of nearly 68,000 residents! Our ward’s population is over 44% higher than the average ward population (47,016), and is in fact double the size of some other City wards. All City Councillors are provided the same funding to operate an office, regardless of ward size. To be frank, Bev and I have serious challenges in being able to provide a timely response to e-mails and phone calls because of the high volume we receive daily. PLEASE be persistent – keep e-mailing and calling - we will respond! Please join me to celebrate the opening of park upgrades in our ward! • On Sat., September 30, there are two events: 10:30 a.m. at Grandmont and Ducharme Parks; as well as 2:00 p.m. at Kirkbridge Park. • Next month, on Sat., October 14, meet me at 11:00 a.m. at King's Park. These three parks have had significant upgrades, and we will be holding a small celebration event at each one. Everyone is welcome! A new contract for recycling, garbage and yard waste curbside collection will begin on October 1, 2017. This will change the collection day schedule for 59% of residents in Winnipeg, including the South Winnipeg-St. Norbert ward. To learn what day of the week your collection day will be, SEE Change in Collection. I’ve prepared a report highlighting 3+ years of work focused on combatting illegal rooming houses. The report identifies the problem, stakeholders, and significant by-law changes that have occurred related to safety, neighbourhood liveability, and by-law enforcement. I encourage you to read the report and reflect on the multiple accomplishments as well as work in progress! Huge thanks to the Fort Richmond-University Heights Neighbourhood Association for becoming involved, taking action and contributing to many of these significant changes! See Illegal Housing. As of July, 2017, residents are able to search properties on the City's website to learn if building permits have been secured for construction in residential homes. If a homeowner is going to build, add, renovate or alter any part of a building or residence, or perform work on electrical or plumbing systems, a permit must be obtained prior to starting work. Otherwise, the renovation is being performed illegally. This new tool will be useful in combatting illegal rooming houses. Often rooms are added, basement windows installed, and rewiring occurs - all without permits. If you see suspicious construction activity, use the Building Permit Search Tool to see if a permit has been issued. If not, contact 311@winnipeg.ca and report. In May, 2017, many of you participated in a consultation process where the City was considering the construction of a pedestrian and cycling bridge OVER Pembina Highway at Bishop Grandin. Regrettably, at this time, the project is not deemed a priority by the City, and is not being submitted in a Federal funding request for financial support. SEE Not Prioritized - Bishop Grandin Walk-Bike Bridge over Pembina. 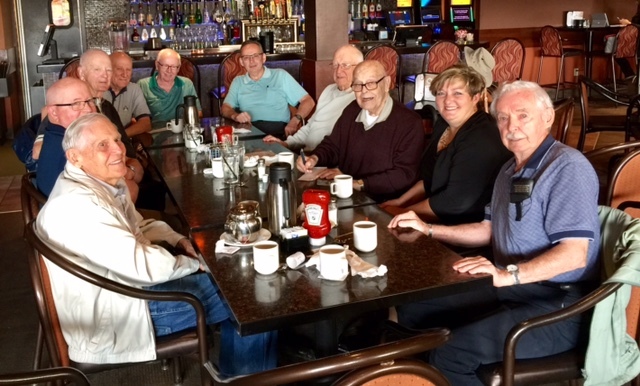 A great meeting with the "South Winnipeg Senate" Coffee Club! Always enjoy chatting with residents of the South Winnipeg-St. Norbert ward!